Nasi Kunyit is rice dish that transcends two cultures in Malaysia; Chinese and Malay. For the Chinese, Nasi Kunyit is part and parcel of baby’s full moon. It’s a Chinese custom to celebrate your child’s 1 month anniversary since it’s birth; sort of a celebration of life. My mom used to tell me that baby’s one month celebration signified that the child had crossed the danger period of his/her life. Old wives’ tale but during full moon celebration, nasi kunyit, red hard boiled eggs and chicken curry are distributed amongst friends and family. Apart from this, nasi kunyit is also a favorite tea time/breakfast accompaniment. The Malays usually cook Nasi Kunyit during their festive season like during the month of Ramadhan, Aidfiltri, Aidiladha, and during weddings and kenduris (feasts). 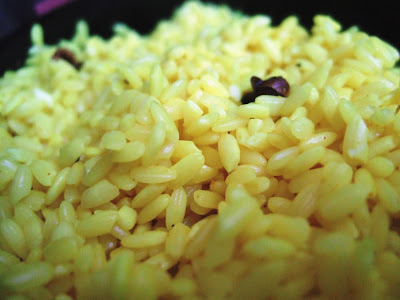 There are many ways to cook Nasi Kunyit and one of its key ingredients is turmeric. It’s what gives the rice dish a yellow color. 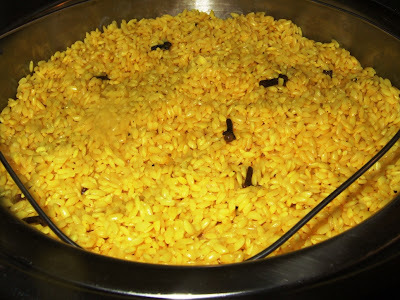 Glutinous rice is used instead of the normal long grain rice. The high starch content make Nasi Kunyit a sticky affair but delicious when eaten together with curries. 1. Wash glutinous rice thoroughly and transfer it to a big bowl. 3. Put the roasted ingredients in the bowl with the rice and throw everything else, except the pandan leaves, into the bowl and let it sit overnight or at least 6 hours. 4. Scoop the rice out with a sieve and transfer the rice and all the other ingredients (throw away the tamarind rinds) into a steamer with the pandan leaves and steam for 2 hours or until rice is done. I ate mine with lamb curry. 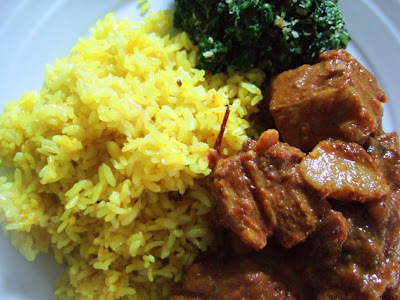 Recipe for the lamb curry will be up soon! I did not know that turmeric rice is part of baby’s full moon for the chinese. Really? Delicious! I love the festivive color of your rice!